Our easy Layaway plan is our interest-free payment plan that allows you to make monthly installments on your purchase. 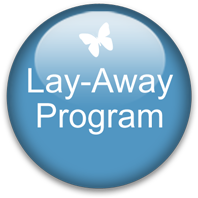 Layaway is available from 3 months to 6 months, depending on the plan that you choose. Simply make a small deposit on your item and we will keep your jewelry aside for you until it is paid in full. Once you have paid for your purchase in full, we will ship your jewelry to you. The advantage of our jewelry layaway program is that if the price of a jewelry item increases over time, your price will still remain the same. It will be locked in at your original purchase price. This also affords you the flexibility of paying for your jewelry over time. Payments are accepted only by Bank Wire or Cashier check for this type of Layaway due to the interest-Free services. Each time a payment is due, you will receive a reminder 1 week before due date via email. After the initial set-up of your layaway plan, you get relax and let us do the rest! Your jewelry will be automatically shipped to you once the payments have been completed. Since this is Our Company layaway finance plan & does Not related to your credit score. We cannot cancel any order on layaway once the first two Installment are paid. However under any circumstance if we have to cancel your order on layaway there will be a 15% Interest fee that will apply towards the cancelation. You may also choose to pay off the entire balance in full at any time and receive your jewelry sooner. email us with your information. If you are emailing your information, please include your full name, address, phone #, item# you would like to purchase, number of months you would like (3-6), and your credit card information, including account # and expiration date on file for records. A minimum order of $1500.00 or greater is required to start our layaway plan.